I had the fortune in the early 70s to Live in Israel and spend Christmas in Bethlehem. It was a magical evening back before Israel became a major tourist destination. The town had little change in hundreds of years. Barring electricity and roadways for the cars it was easy to imagine how the town felt a thousand years before. Being only a little more than 75 miles from our house I had been there several times before and knew my way around already. I still have a beautiful Mother of Pearl Backgammon board Bought from a small shop on the square on a prior visit. 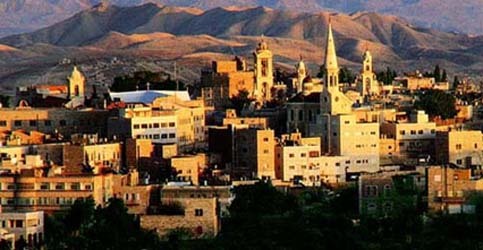 Other than Christmas you would never tell it from the other small primitive Arab towns across the desert. There was no real jump at you advertising of the Biblical significance of the place. 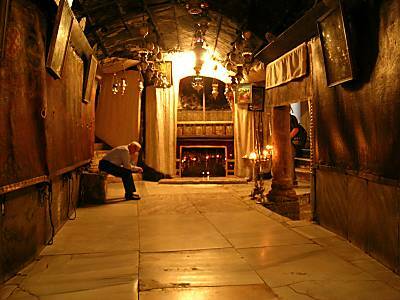 I don’t remember any signs beckoning you the come see the birth place of Jesus. I have a feeling if I went back today that small shop with all the Mother of Pearl would be the site of a McDonalds complete with a McManger kid’s meal with a little plastic baby Jesus. I hope not. The drive from home was a pleasant one. We followed the Mediterranean coastline past the Caesarea Castle’s ruins left from the days when it was the Roman Capital of Palestine in the 1st century BCE under King Herod before being conquered during the Crusades in 1101. Being about a half an hour from the house we often spent afternoons exploring the place. Once we hit Tel-Aviv we turn inland and shoot over to Jerusalem. Just another five and a half miles south and we were cruising into Bethlehem. The name translates to “the house of bread” in Hebrew. On the town’s edge was a military check point set up for the day inspecting every car entering the festivities. The soldiers asked several questions during the curbside screening and once they were satisfied off you go. If I remember right one of the things they were looking for was non-Christians. Only Christians were being allowed into the city. Our family was non-religious but we passed the profiling with the help of our United Nations license plates. The town was busy but not packed. There was a warning of a pending terrorist attack planned for that night so most people choose to stay away. It was usually a ghost town except for the locals. We found a parking place for our VW bus on a back street a few block from the square and hit the well worn stone streets excited to witness a site few get to enjoy. Once we were in the square we were hit with a decision. Which birth site to see first? No one really has any idea where the mythical event was said to happen or what date it landed on but over the centuries a couple of places have become popular and the Romans decided to celebrate it on the same day as the celebrations of the virgin birth of the Persian God of light, truth and goodness, Mithras. Mithras was the most popular of man-gods before Christianity was created and served as a model for the creation of the Jesus figure. It wasn’t until the Roman Government decided to drop Mithraism as the official religion in favor for Christianity in the early fourth century that the Jesus story began to slowly take hold. We chose to do the grotto site first. We had to walk to the outskirts of town where we found a group of people collected under the shallow cave like grotto singing Christmas Carols holding candles. The holy opinion is that Jesus was born in a cave of some sort. Far different than the dime store manger sets people have come to accept. The whole scene was a magical one and even a non-believer like myself found it amazing! 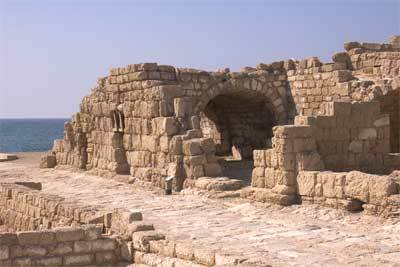 While living in Israel I found the Biblical sites fascinating. The history and the superstitions are sometimes difficult to separate but that made the puzzle of time even more mystical. We hung out at the grotto for quite a while. The energy from all the worshipers filled the air to an emotional level. Eventually it started to drizzle lightly and we migrated towards town with many others that were not sheltered by the grotto. 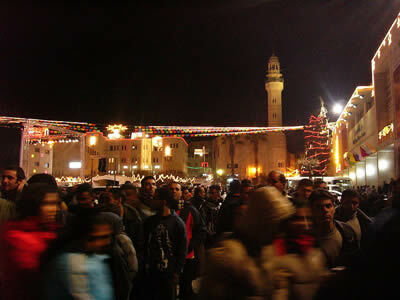 The short sprinkle had ended by the time we got back to the town’s festivities and the night sky was clearing. In Israel it doesn’t rain in the summer. People actually remove the windshield wipers from their cars in the summer. But in the winter it rains every day. You can set a watch to its predictability. It never gets much colder than 50 degrees at night so it’s not too bad. Winter is when all the plants bloom and everything gets green. One advantage to the dry summers was that you could plan anything in advance and know with certainty what the weather will be. Once back to the small town square we stood in the crowd to hear a presentation from a small stage set up. Assorted politicians and the like blabbered on before the headliner climbed up to the podium. I don’t remember his name but he was an Apollo Astronaut that had walked on the moon. In 1972 only a twelve men had walked on the moon so I could probably figure it out but there’s no need. I remember listening to him ramble on while looking up at the almost full moon amazed to think that he had been there wandering around. The whole notion that I was standing at the birthplace Jesus whose teachings form the basis of Christianity while listening to a man that went all the way to the moon and back in a craft named after Apollo, the mythical Greek and Roman God of prophecy. The bright moon peaking through the thin clouds gave the town an almost eerie glow. There were a lot of military teams patrolling the streets, each one with the radioman’s backpack radio and 12 foot high whip antennas marking their progress up and down the streets. The flat roofs had sandbag installations protecting the machine gun nests and snipers that scanned the crowd watching for any commotion. From there we walked over to the Nativity Church Where many believe Jesus was born in a cave under the church. Like a lot of major religious sites many different factions built their place of worship on top of the ruins of the last and I think that’s the case here. The passageway and stairs was a crooked path that always suggests a turbulent past. Once to the bottom there is a small pool and fountain. Like anywhere in the world where there is a fountain there are Americans throwing coins in it. We are mocked throughout Europe for this trait. 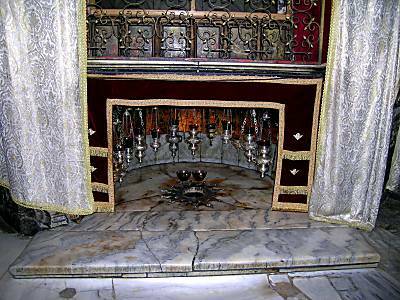 Shortly after passing the small coin filled pool we came to a small fireplace looking place marked with a star in the mosaic of the floor. I was really expecting more but it was still interesting. This site lacked the warm fuzzy "Kum Ba Yah” feeling of the Grotto filled with people singing and laughing, rocking back and forth rhythmically. We were ushered out through a different passageway out I think and eventually found ourselves back in the familiar town square. The ride home was filled with silence and reflection. I remember passing Jerusalem where we use to spend much of our free time wandering around in the old city. We had a favorite restaurant down the hill from the Jaffa Gate that I would love to go to right now. With our diplomatic status we often had access to rooms for the night just inside the Jaffa Gate where we could relax and watch the foot traffic passing through the gate like it has for an eternity. I knew all the streets by heart and many of the shop keepers greeted us by name when we passed. Living in Israel was a magical time in my life that I am very lucky to have experienced. After a short ride up the coast we finally settled into our Haifa living room looking off our balcony at the lights of Haifa Bay stretching all the way to Acre, the oldest continually used harbor in the world to the west and seeing the lights of Nazareth to the east before calling it a night.